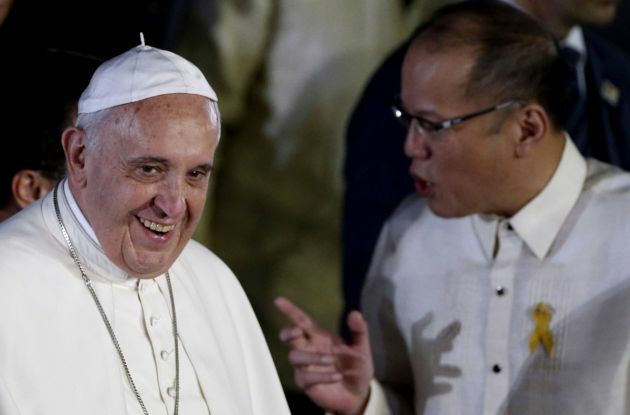 (Photo: REUTERS / Erik De Castro)Happier times for the Catholic Church in the Philippines. Pope Francis smiles as Philippines' President Benigno Aquino talks to him upon his arrival at Villamor Air Base for a state and pastoral visit, in Manila January 15, 2015. Tens of thousands of people lined the streets of the Philippines capital of Manila on Thursday to welcome Pope Francis on his first visit to Asia's largest Catholic nation amid one of the biggest security operations in the country's history. He is one of a crop of worldwide populist leaders, and many of his words make Donald Trump look like a quiet-spoken diplomat as he has again been attacking one of his bugbears, the Catholic Church. Philippines President Rodrigo Duterte has unleashed what Russia Today called his colorfully-worded wrath on the Catholic Church again, saying the organization is corrupt, "full of sh*t," and he accused priests of committing sexual abuse. Duterte on Jan. 24. accused the church and its bishops and priests of corruption, womanizing and said he was abused by a priest while he was a student of Ateneo de Davao University. He also claimed three cabinet secretaries had been molested. The sharp-tongued Philippines president was speaking to the families of Special Action Forces who died in Mamasapano in 2015. Before his speech, The Manila Times newpspaper had carried a Jan. 21 editorial headlined, "Why President Duterte needs the Catholic Church." and his own vice-president has chastised him on his frequents attack on the church. Instead of lambasting priests and bishops, President Duterte should work with the Catholic Church to achieve the collective goals of Filipinos, Vice President Leni Robredo says. as these only "create animosity between the government and the Catholic Church." "My hope is we should learn to respect our differences in faith and look for ways where we can help one another," the Vice President said in an interview in Camarines Sur over the weekend. In his fiery sppech, however, the president advised the crowd to read "Altar of Secrets" by Aries Rufo to discover the truth about church officials, saying he would resign if its allegations were untrue. He added he might publish his own book about the Church, entitled "Hypocrisy." "I challenge the Catholic Church," he said. "You are full of sh*t. You all smell bad, corruption and all." It wasn't all hate, however, Duterte pointed out that he and the Church have something in common: womanizing. He told the audience that Bishop Teodoro Bacani had two wives, like him. He dared the top Catholic Church officials in the Philippines to resign and said he would do the same if they would do so, the Philippine Daily Inquirer/Asia News Network reported. The President launches his attack on the Catholic Church leaders after he defended his war against illegal drugs during his speech. Church officials have strongly condemned the extrajudicial killings that have followed Duterte's administration's crackdown on the narcotics trade. Duterte said he and the Catholic Church officials have the same sin - that of womanizing. He noted that one bishop - Bishop Teodoro Bacani - had two wives like him. He upbraided them for asking for a Pajero vehicles during the time of President Gloria Macapagal Arroyo. "Shouldn't you be ashamed of yourselves? That's so expensive and so many people have nothing to eat," he said. The bishops knew they were not supposed to receive anything from the government, and yet they asked for the high-end vehicle, he said. "It was pure graft and corruption," he asserted. Most politicians have been afraid of offending officials from the Catholic Church, but not him, Duterte said. He noted that despite the church officials "politicking" and warning people against him, he still won. In its Jan. 21 editorial The Manila Times noted, "Indeed, the Church certainly commands far more credibility and respect than the government. "The Philippine Trust Index of 2015, the latest nationwide survey done by public relations company EON, counted nearly three-quarters of Filipinos (73 percent) trusting the Catholic Church, far ahead of the academe (51 percent), media (32 percent), and the government (12 percent)."